The lace-up costume waist cincher is made of red vinyl. The cincher laces up through professional-strength grommets. The peasant shirt is short-sleeved and made of white cotton. It has elastic in the neckline and sleeves for a comfortable fit. 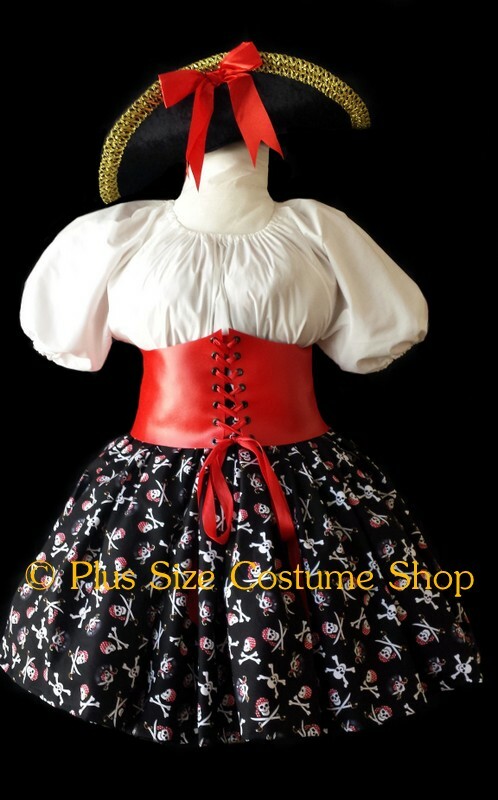 The skirt is made of black patterned cotton with skull and crossbones pirate design. The skirt has an elastic waist for comfort. The skirt will be hemmed at 24" in length (approximately knee-length on someone of average height) unless a specific shorter length is requested.